The day of 07/07/07 is of great importance to many people all over the world. Many sealed marriage relationships, business ventures, etc. 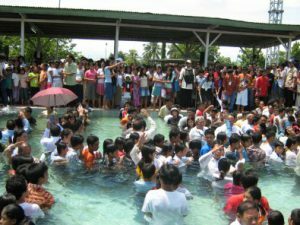 In General Santos City in the Philippines, over a thousand people sealed their relationship with Jesus Christ through baptism. Three months prior to this grand event, ministers and brethren from dozens of churches under Southern Mindanao Mission worked diligentl y – giving Bible studies, holding satellite meetings, doing house-to-house visitations and giving VOP lessons. Their hard work paid off. 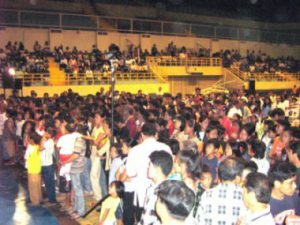 During the “Joy of Living” Crusade by Dr. Dan Smith of La Sierra University, which was held at the General Santos Gymnasium on June 29 to July 7, 2007, over a thousand (1,042 to be exact) were baptized. The adopted ministers of Adopt a Minister International participated greatly in this endeavor. Pastor Wendell Serrano, the executive secretary of South Philippine Union Conference was Dr. Smith’s translator. During the altar call, hundreds of the seminarians responded to the calling of the Holy Spirit, and Dr. Smith prayed for them. 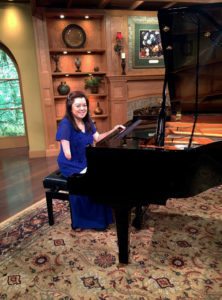 There was an estimated 3,000 people who attended every night, including the brethren and the seminarians. We have 42 Adopt a Ministers in this Conference. 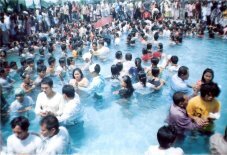 The baptism was held at the General Santos City Sports Complex. Thousands of Adventists came to witness this special event. Twenty-four ordained ministers participated during the baptism. We know all of heaven was happy to witness this grand happening. Indeed, what a wonderful day in heaven it will be when our Savior, our loved ones, and those whom we labored for, we all shall see. Amen.